Exploring space while working with top-notch scientists is a once in a lifetime opportunity for for any child who may have aspirations of being an astronaut, scientist or researcher. 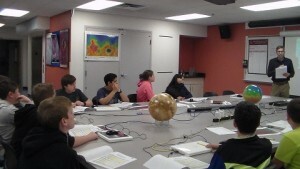 A group of 7th and 8th grade students in the action lab class at Explorer Middle School recently participated in the Mars Student Imaging Project (MSIP) at Arizona State University (ASU). In October, students in Janice Mak’s pre-engineering class began learning background information about Mars’ geological features and making comparisons to Earth. Students selected a question they wanted to investigate about Mars and formulated a hypothesis, decided on how they would collect data, used JMARS to collect data, and analyzed their data to come up with results and conclusions. “The most amazing part of the MSIP experience is that my students actually got to be scientists and do authentic research on a question that truly interested and inspired them. My students also had the opportunity to work with scientists to refine their previous work, go deeper and finally present their findings to a scientists and receive feedback,” Mrs. Mak said .